This Jewish man read it, and, well, he has some thoughts. If you’re not familiar with fisking, it’s a column within a column about a column. Drew Magary of Deadspin is the maestro of the art form, and I’m a mere dabbler in it. But as a Jewish man who has dated both non-Jewish and Jewish women, I feel a certain responsibility to join the rest of my brethren online, and fisk the hell out of Carey Purcell’s batch of vaguely anti-Semitic nonsense. As always, Purcell’s column has a grey background, while my unadulterated rage is blanketed in white. That statement was in reference to the demographics of the office’s staff. Almost everyone who worked there was Jewish, and I, a recent college graduate who had spent my adolescence in a largely Christian community in the South, was not. At the time, I had no idea she would end up being so right. The first thing they teach you in hot take school is to begin a column calling yourself [term for ethnic group that you don’t belong to] that you assure everyone was conferred on you by your friends of [said ethnic group]. It’s not getting much better from here, folks. As a teenager, I attended exactly one bat mitzvah, but moving to New York provided endless opportunities to learn about the Jewish faith. Friends invited me to join their families for Passover seders and Hanukkah celebrations. However, it was through my various romantic relationships where I learned the most about Judaism — a religious faith and culture I have grown to love and respect, but that has also contributed to two of my biggest heartbreaks. Firstly, Seder is capitalized, Washington Post. It’s a holy meal. I mean, I thought only the NYT got rid of all their copy editors. Secondly, fine, this paragraph is actually reasonable. I had a similarly sheltered upbringing, but in reverse. 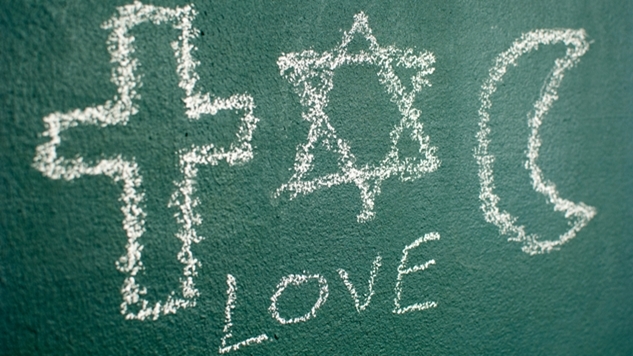 I went to a Jewish elementary school and didn’t have a Christian friend until 6th grade. I’ve learned a lot about Christianity, Hinduism, and Buddhism through three different girls that I seriously dated. On a certain level, I respect Purcell’s bravery to put her ignorance on for display in such a prominent position. So sure, I’ll hear her out. What’s the grievance? And both men said it wasn’t a problem that I was Christian, as they considered themselves culturally, but not spiritually, Jewish. At the very least, they were the most lackadaisical Jews I’d ever met. They never fasted on Yom Kippur or observed Jewish holidays on their own. And when they traveled to celebrate holidays with their families, they made it clear it was an obligation rather than a choice. On more than one occasion in conversation, we laughed about the fact that I knew more about the Jewish faith than they did. So…you…dated two guys who didn’t practice Judaism—AT ALL—while you dated, but said that Judaism was a reason you broke up…and…you…believed them? Look, fasting on Yom Kippur is the going to Church on Christmas of Judaism. If you don’t do it, you can’t even think of pretending that you’re a semi-practicing Jew. I would feel bad for Purcell if she didn’t immediately turn around and point the finger at reform Jews like myself who supposedly want to ditch our nice Christian girlfriends to grow out our payot, don our tzitzit and go spend the rest of our lives praying at the Western Wall. Of all the faiths polled by Naomi Schaefer Riley, author of “Til Faith Do Us Part: How Interfaith Marriage Is Transforming America,” Jews are more likely to intermarry than other religions. A study conducted by the Pew Research Center in 2013 reported that almost half — 44 percent — of married Jews in the United States have a spouse who isn’t Jewish. The tradition seems to be passed from generation to generation: Eighty-three percent of married Jews who have just one Jewish parent are married to someone who is not Jewish. A small group of leaders in the Conservative Jewish movement are even working to promote acceptance of interfaith marriages. I would bet a lot of money that she lifted this entire paragraph verbatim from an e-mail that she sent to one of her exes. In what I’m sure is completely unrelated to Jews’ proclivity to marrying other faiths, Jews are roughly 2% of the U.S. population. There are even less Jews in Europe, comprising less than 1% of their population. You see Carey, Jews have been whittled down throughout history by various great powers, so we’re kind of touchy about being singled out—which you’d know if you dated Jews who took their Jewishness seriously…which supposedly you did. These breakups weren’t about what you think they’re about, and I think this column is putting some of the real reasons behind the splits on display. So far, Purcell has raised more specific instances of her problems with her exes not being Christian than specific instances of her exes caring about her Jewishness. Also, if you think the overbearing Jewish mom stereotype is confined to our small sliver of the population, talk to literally every minority in America since its inception. Irish, Greek, Italian, African American—whomever. We’ve foisted this stereotype onto the mother in every minority group in America. Congratulations to Purcell on giving life to this extremely unoriginal smear which only serves to buttress the cause of white male supremacy. Not being Jewish was not the official reason either of these relationships ended. There were other problems — money, careers and plans for the future — problems I wanted to at least try to work through. But when I tried to talk about them, somehow the fact that I wasn’t Jewish came up — even in conversations that had nothing to do with family or children. When I asked, “What does that have to do with this?” they didn’t — or couldn’t — answer and kept talking about Judaism. This is sure looking like a story with no heroes. Her non-practicing boyfriends just couldn’t bear to get married to someone who doesn’t practice Judaism, and the only times where their Jewishness was raised came during conversations about their futures, and “they weren’t able to explain” why Judaism all of a sudden mattered so much. I don’t know who I’m angrier at right now, her exes for not being able to be honest with her and sending her down this path, or Purcell for taking them at face value and willingly becoming a useful idiot for anti-Semites. After we broke up, both men went on to find serious partners who were, in fact, Jewish. And while I try not to look back after a relationship ends, to go full-on Carrie Bradshaw, I couldn’t help but wonder if this was not just a coincidence but a pattern I should pay attention to. I guess dating me had been their last act of defiance against cultural or familial expectations before finding someone who warranted their parents’ approval — perhaps the equivalent of a woman dating a motorcycle-driving, leather-jacket wearing “bad boy” before settling down with a banker with a 9-5 job. I now half-jokingly consider myself a Jewish man’s rebellion and guard myself against again landing in that role. Okay, back to being angry at the author of this hackjob of a column. “A pattern I should pay attention to” landed Purcell at the conclusion that all Jewish men are weak-kneed ninnies who can’t say no to mommy and who eventually let their family take full control over their dicks for them. But, living in New York and working in theater, I frequently meet Jewish men. At almost every event I go to, they approach me. As flattered as I am, I don’t welcome the complications and potential heartbreak I’ve experienced back into my life. I’m going to end with a screenshot of the last paragraph of the column, as my instincts tell me that it might be changed, and I want to preserve it for posterity. For her kicker, Purcell put away the anti-Semitic dog whistles and took out a full-on bullhorn. Shame on The Washington Post for publishing this offensive drivel.